In wet conditions, specially designed Aqua Drainage elements quickly drain water through a unique tube system into the tread grooves. At the same time, the water film under the pattern blocks is pushed into the Aqua Channel surface sipes, which accelerate water evacuation into the main grooves. Benefit: High levels of wet braking and cor-nering grip on wet roads. The Chamfered Edge prevents the “rolling-in-effect” of the pattern blocks while braking. 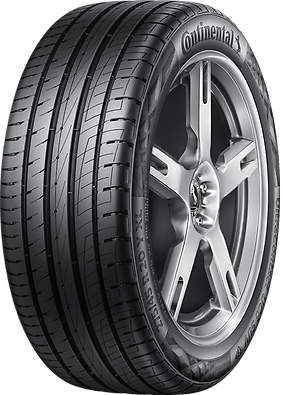 The braking pressure is evenly distributed across the tread block surface for maximum contact area. Benefit: High stability of each tread block for better braking on dry and wet roads. 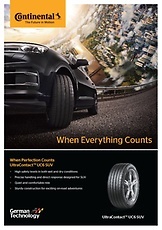 Benefit: Excellent wet grip and wet handling performance. SUVs normally are heavier vehicles with a higher centre of gravity than passenger cars. This puts more load on tyres when braking and cornering. The double tie-bar is placed in the lateral grooves on the shoulders to connect the blocks for higher stability and stiffness during braking. During cornering the Double Tie-bar supports the blocks on the shoulders to form a solid tread element. The blocks are stabilized and the UC6 SUV delivers direct feedback and high grip. Benefit: Precise response and stability when cornering. Benefit: Comfortable ride with low noise level. The polymer chains of the UC6 SUV tread compound are entangled and connected to each other to form an interlocked polymer network. This improves the wear performance and robustness of the tread.